First, because of the nature of this work, I interact with a variety of kids with different diagnoses, challenges, and abilities. When we start with a private lesson, it allows me to individually interact with the child, evaluate them, set goals, and determine if our program or horses will be a good fit. Additionally, private lessons gives parents a chance to determine if our program is the right fit for them and their family. Next, expectations and the routine need to set. At Empowering Strides, we have a routine for all of our lessons and expectations for every one of our riders. I have found that it’s easier for riders to adapt to the routine and expectations at first when they are the only student. Not only does this allow them to better adapt, but it also allows us to take extra time, as it’s needed. Private lessons also allow me to alter our routine, if it doesn’t work for the child. These individualized lessons set students up better for when they join semi-private lessons. Additionally, I have to think about the horses. It’s important that each child is paired with the horse that they work best with. Much like each child, each horse has a different personality and tendencies that may or may not work for an individual child. 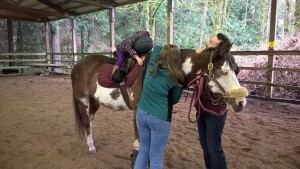 Once the child has been matched with a horse, they need to be placed in a lesson when that horse is available. Finally, joining lessons is a bit of an art. For a lesson to be effective, the riders need to be at similar lessons cognitively, behaviorally, and with their abilities. If one child is shy and requires extra time to warm up, they won’t work well with a child who is excited and ready to start immediately. Private lessons allow me to consider the best possible match for new students. 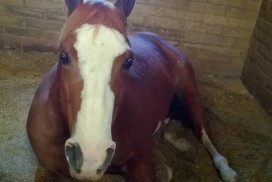 Placing a new rider immediately into semi-private lessons can be overwhelming. While the amount of time each child should stay in private lessons differs, this time gives the child a period to adjust and gives the instructor valuable time to make sure all future lessons move as smoothly as possible.